Greetings again from the darkness. Maybe the best part of “based on a true story” movies is that they allow for a quick spotlight on both unheralded heroes and under-the-radar injustices around the globe. The first feature from writer/director Zeresenay Mehari brings warranted attention to the barbaric tradition of telefa in parts of rural Ethiopia. This so-called cultural rite involves a posse of men abducting a young girl whom one of them has chosen to be his wife. Tizita Hagere plays Hirut, a 14 year old girl who is excelling in school and dreaming of attending university. 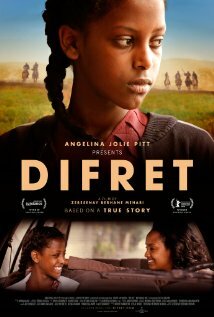 While skipping home from school one day, Hirut is abducted by a group of men on horseback, who lock her away in a nearby house. Later she is visited by the man who wants to make her his wife. He beats and rapes her, leaving her to sleep injured on the dirt floor. The next day, Hirut tries to escape and ends up shooting her would-be husband. She is charged with murder, and it’s here that we come to understand the lack of civil rights or equality when it comes to measuring the worth of a man versus a woman in this community. Hirut’s case comes to the attention of Meaza Ashenafi (Meron Getnet), a partner in the Andinet Women Lawyers Association. She fights for the rights of women and girls in a society where few rights exist. It’s clear to any reasonable person that Hirut’s actions were in self-defense, but reasonableness is not the determining factor … in fact, the village elders hold a community meeting and hear from Hirut’s father and the father of the dead would-be husband. We are able to compare this form of village justice to the equally unbalanced scales of the courts. The actual 1996 case of Aberash Bekale (on which this story is based) was a turning point in the legal system for Ethiopian women. This horrific process of abduction for marriage does still go on, but not in the mass numbers of the past. Of course, even once is too many. The film does a nice job of contrasting cultural versus civil laws, and how not all “traditions” should be continued simply because they are labeled as such. Mr. Mehari’s film has done well on the festival circuit, and certainly is boosted by the presence of Executive Producer Angelina Jolie. It’s a real world example of just how important education and equality is, and how many of us take this for granted, while others live in areas where defiance could cost them their liberty and life. This entry was posted on Friday, October 23rd, 2015 at 7:54 pm and is filed under Drama. You can follow any responses to this entry through the RSS 2.0 feed. You can leave a response, or trackback from your own site.